Add a touch a modern sophistication mixed with comfortable seating with this 4 ft. bench. The powder-coated steel seat features vertical slots, and the concrete bench ends provide a sturdy base. This versatile bench can be used for both indoor or outdoor purposes, and can be placed alone or used to create an entire seating areas. 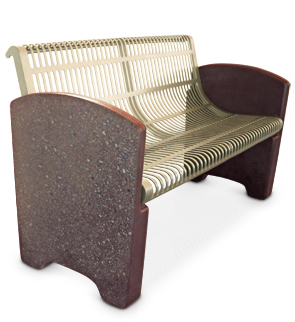 The steel seat is available in the powder-coated color options shown below, and the concrete bench ends in any of the various concrete finishes shown. Concrete bench ends can be left with a natural exposed concrete finished, or polished for a more glossy appearance.